MY KIDS TOTALLY GET ALONG. 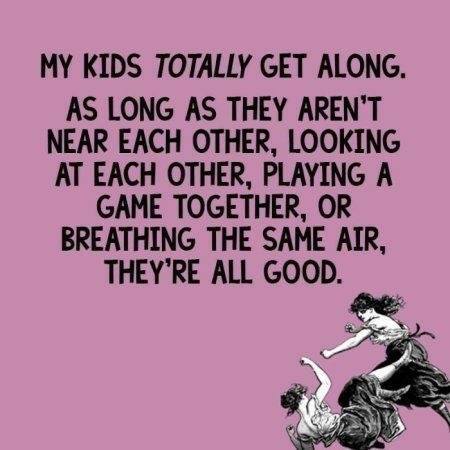 AS LONG AS THEY ARENT NEAR EACH - ProudMummy.com the Web's Community for Mums. MY KIDS TOTALLY GET ALONG. AS LONG AS THEY AREN'T NEAR EACH OTHER, LOOKING AT EACH OTHER, OR BREATHING THE SAME AIR, THEY'RE ALL GOOD. Paige Mcneish Connor McNeish haha this is you two!